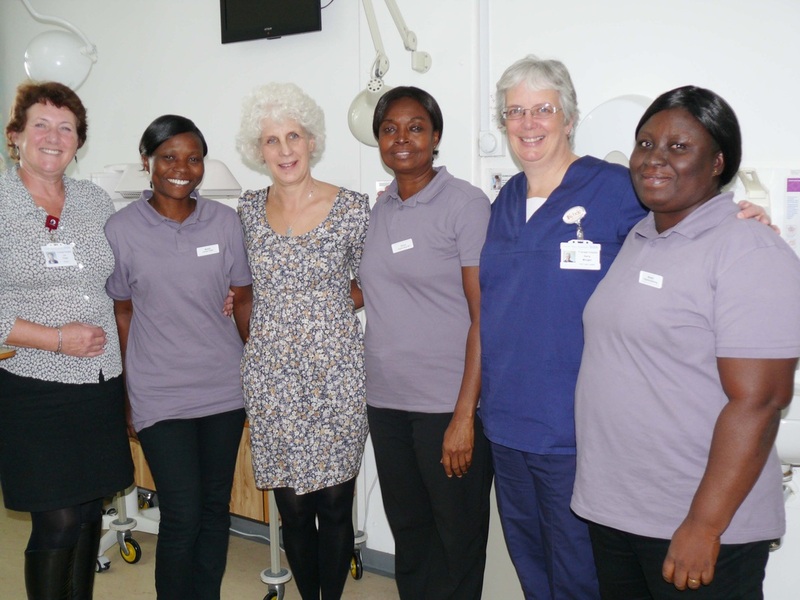 Liz Floyd, Cecilia Tetteh, Fiona Bryce, Susana Asamoah, Kerry Morgan and Victoria Ahwireng at the Friarage maternity unit. SOUTH Tees Hospitals NHS Foundation Trust welcomed three midwives from Ghana as part of a project involving Kybele – a non-profit humanitarian organisation dedicated to improving childbirth safety worldwide through educational partnerships. Kybele’s role is to bring professional medical teams into host countries, to work alongside doctors and nurses in their home hospitals, to improve healthcare standards. Fiona Bryce, clinical director for obstetrics and Kerry Morgan, risk midwife at the trust and Liz Floyd, midwife, are all involved with the Kybele project, working together with Ghana Health Service. They also work alongside the Institute of Health Improvement (IHI) to see what other organisations are doing to improve healthcare around the world. As part of an developing working partnership to share knowledge, learning and good practice, the trust team regularly visit Ghana in an advisory role, two or three times a year to help improve efficiency and healthcare practices and ultimately to help reduce neonatal and maternal mortality. In Ghana, maternal mortality is estimated to be around 560 deaths per 100,000 live births. The leading causes of maternal death are pre-eclampsia, acute haemorrhage, sepsis, obstructed labour, non-hemorrhagic anemia and unsafe abortion. Overall, 92 % of women attend at least one antenatal clinic, but only half of all deliveries are attended by a skilled health professional, such as a midwife or physician. Susana Asamoah – labour ward manager and triage midwives Victoria Ahwireng and Cecilia Tetteh from Ridge Regional Hospital, Accra, Ghana, visited the Friarage Hospital in Northallerton and The James Cook University Hospital in Middlesbrough to see how their maternity unit’s work. Their aim was to learn from other areas of practice and develop innovative ideas to benefit patient care in their own busy regional hospital in Ghana. The main focus of their visit was to observe maternity triage to improve the assessment process when women first arrive, give them appropriate advice and ensure early detection of high risk problems. They also wanted to learn more about patient flow and how it is achieved. Susana said: “We were very interested to see how things work in the UK and we have learned a lot of lessons which we can take home with us. “We were particularly keen to hear from the midwives and staff at the trust their ideas on good customer care and improving the relationship between patient and midwife so we can get to know our patients better and how they are feeling. An example of transferrable practice that could benefit patients back in Ghana is, sterile water injection – a simple pain measure, and also how the partogram assessment tool for labour can be used to the best advantage. Fiona Bryce, on behalf of the team, said: “The trust is committed to developing services to improve patient experience and ensure high quality care and it is a great privilege to be able to share professional roles and practice and to understand the reality of working in a hospital in Ghana, and for them to understand what life is like working at our hospitals.